Rummaging through the Sweat: The Story of the Fleshtones, America's Garage Band archives recently, I came across two photos from the late 1970s, neither of which made the cut for the book. 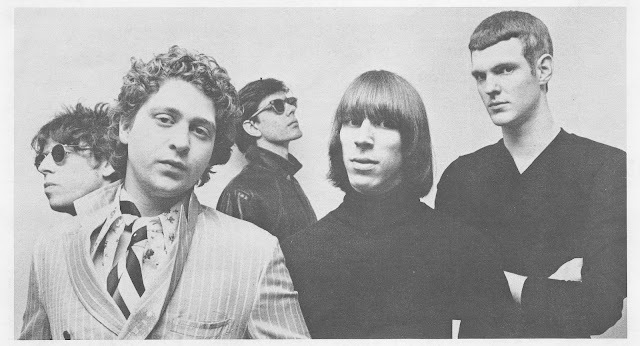 They accompanied "The American Sound of The Fleshtones," a 1979 article written by Todd Abramson for the second issue of his 'zine Young, Fast & Scientific. The first photo, taken by Dorothy Affa, is one of the earliest promotional shots of The Fleshtones. 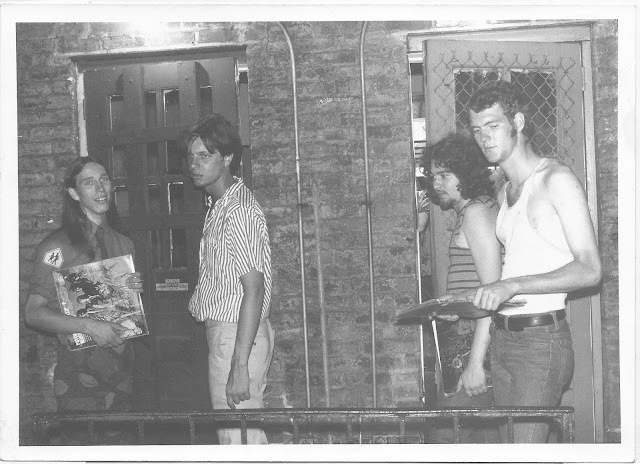 The gentleman on the far left is Mitchell Ames, who in 1979 joined the band briefly on second guitar; he's joined, left to right, by Lenny Calderon, Peter Zaremba, Keith Streng, and Marek Pakulski. "Mitchell and Lenny are typifying Rock bad boys, and Peter and Keith are channeling Warhol and a young Roger Waters, respectively," Pakulski mused after I showed him the photo. "Me, I have no clue what that look is about. Ah, youth." The second photo (uncredited) is a favorite, the guys standing around holding stacks of records, that old pose. Streng's clutching a prized copy of Blue Magoos' Psychedelic Lollipop from 1966 and Calderon's holding Love's debut from the same year (he's showing us the back). Pakulski: "Looks like we've just been released from juvy." And now off to rehearsal.